Registration for the Spring 2019 semester is open now! For information about signing up for spring classes, visit www.kellogg.edu/registration. To apply to KCC online for free, visit www.kellogg.edu/step1. Interested in history? Here are nine history (HIST) classes offered at Kellogg Community College during the Spring 2019 semester, which begins Jan. 11. For a complete list of Spring 2019 semester classes offered at KCC, visit www.kellogg.edu and click on “Class Schedules” in the top menu to search for sections. A survey of the political, economic and social history of the United States from the colonial era to 1877. A survey of the political, economic and social history of the United States from 1877 to the present. This course is a survey of the major developments in European Civilization from the ancient Middle East, Greece and Rome, medieval period, Renaissance, and Reformation to early modern Europe (mid-1600s). Selected political, economic, social, religious, intellectual, and aesthetic elements that form present-day western civilization will be emphasized. The course will also emphasize the interchange of ideas between Asia, Africa, and the West, as well as an understanding of our cultural history as essential to the study of other cultures. This course is a survey of the major developments in European Civilization from the mid-1600s to the present. Selected political, economic, social, religious, intellectual, and aesthetic elements from the scientific revolution to the contemporary world will be considered. The impact of revolution, nationalism, and world war upon recent world events will be emphasized. The course will also include the interchange of ideas between Asia, Africa, and the West. An interdisciplinary study of various world civilizations in Africa, the Americas, Asia and Europe from 10,000 B.C.E. (Before Common Era) to 1500 C.E. (Common Era). This course will use a comparative approach to study a variety of global themes and patterns over time. An interdisciplinary study of various world civilizations in Africa, the Americas, Asia and Europe from 1500 C.E. (Common Era) to the present. This course will use a comparative approach to study a variety of global themes and patterns over time. The origin and development of the contemporary political, economic, and social institutions of the State of Michigan. The relation of this history of the state to that of the nation is stressed. This course is a study of the historical, geographic, economic, political and social institutions of the various African countries and territories. The course examines and analyzes factors contributing to unique conditions of African society, past and present. The first Spring 2019 classes start Jan. 11, and the semester ends May 6. For information about signing up for spring classes, visit www.kellogg.edu/registration. For more information about studying history at KCC, visit www.kellogg.edu/history. 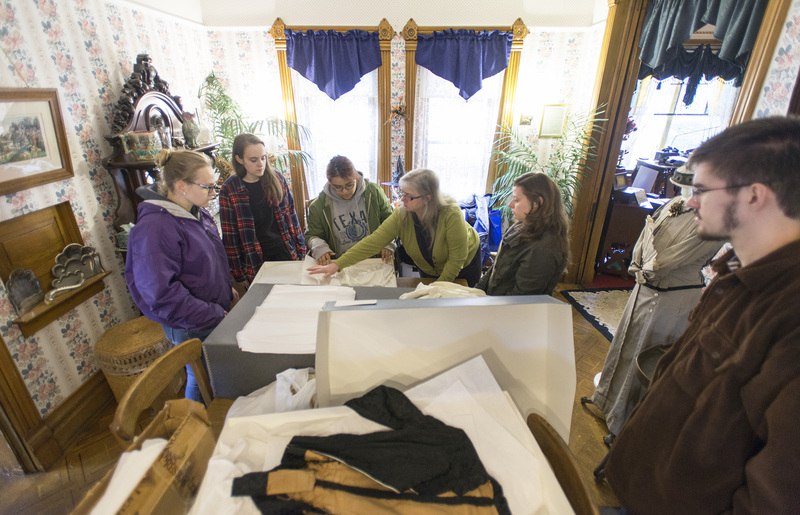 Pictured above, KCC Library Services Faculty Coordinator and College archivist Kassie Dunham, center right, assists students in Dr. Ray DeBruler’s History of Michigan class with a project at the Kimball House museum in Battle Creek this fall.